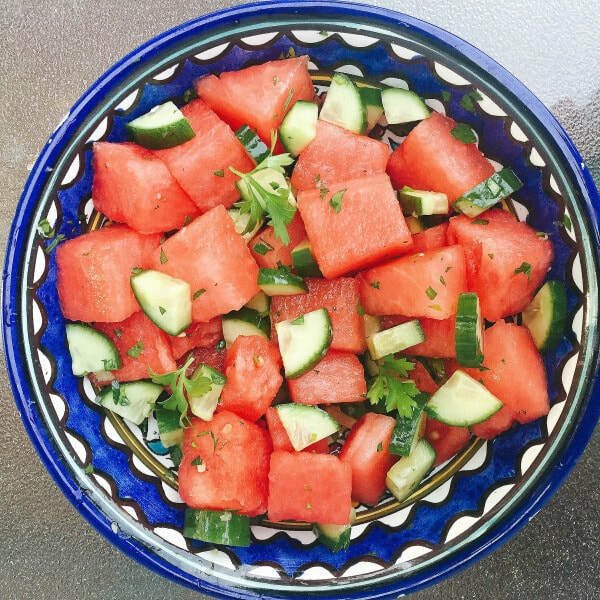 Watermelon, cucumber and herbs are a delicious combination that's perfect for summer. And check out this calendar to find out when you might find these ingredients at your local farmers market. This salad uses lime juice and herbs for flavor, but you could also try this salad with a balsamic vinaigrette as well! Combine the lime juice and fresh herbs in a large bowl. Add the cucumbers; toss with a rubber spatula, coating all cucumber pieces. Add the watermelon; fold in gently. Optional: cover, and set aside for 1 hour to allow flavors to blend. *Nutrition information does not include feta cheese.